During the emergency response to the earthquake of April 2016 in Ecuador, I served as national UN Volunteer Protection Officer with the International Organization for Migration (IOM). My work involved promoting the participation of women and adolescent girls in decision-making processes within the camps. Many of the activities developed were conducted with families affected by the earthquake, particularly women and their daughters and sons - in training opportunities for the prevention of gender-based violence, helping women and their families identify common patterns of violence, as well the protection routes that they could resort to. The part of my work that I consider to be the most important is related to the empowerment of women and adolescents through informal recreational activities, where, through focus groups, recording of short films, and training workshops on hygiene and perfumery, we succeeded in promoting the participation of women within the governance structures of the camps. I also organized training workshops to promote new ways of income generation that would help women and their families improve their living conditions and return to some sort of normality. One of the most impactful activities was the set-up of a soap factory together with women from the camps in Pedernales. Between all of us, we fixed up a small house made of cane that IOM provided within the camp, preparing shelves, cleaning and painting all together in order to start up a soap factory that brought great hope for a better future. Living for six months with people affected by the earthquake completely changed my life. It made me greatly appreciate the place where I come from and the human wealth and solidarity of the Ecuadorian people. I learned a lot from the people I worked with, including IOM colleagues and the women and authorities within the camps, and I gained new insights into the running of projects in humanitarian contexts. When the call for UN Volunteers came out for the emergency response to the earthquake, I had just finished a Masters degree in International Humanitarian Action in Spain. I did not hesitate for a second to apply. I knew that I had to return to my country and contribute to the response and the rehabilitation of the affected areas. The contact with people affected by the earthquake reaffirmed my conviction that I had studied what I truly love to do. And working with women and their families taught me that, even in adverse circumstances, there are always reasons to smile. 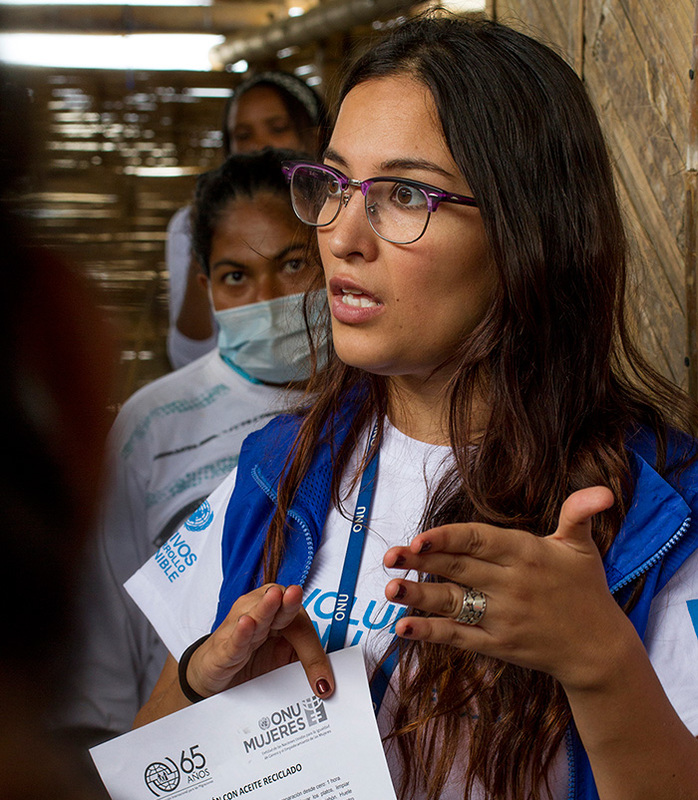 Michelle Pazmiño is one of 24 UN Volunteers who served with the International Organization for Migration (IOM) and the United Nations Entity for Gender Equality and the Empowerment of Women (UN Women) to support the emergency response in the areas affected by the earthquake that hit Ecuador in April 2016, affecting the lives of around 720,000 people and with almost 30,000 people having to seek refuge in temporary camps. Article translated from Spanish by UN Online Volunteer Venita Ramírez. Volunteers in Nepal: "I do it for my country and my community."